Discounted cash flow valuation or DCF valuation is one of the main methods used to estimate the value of a business. This discounted cash flow valuation calculator takes the annual future cash flows from the financial projections template and discounts them back to their value today. This discounted amount is then used as an estimate of the value of the business’s operations or enterprise value. Further information on the application of the discounted cash flow method can be found in our business valuation methods tutorial. 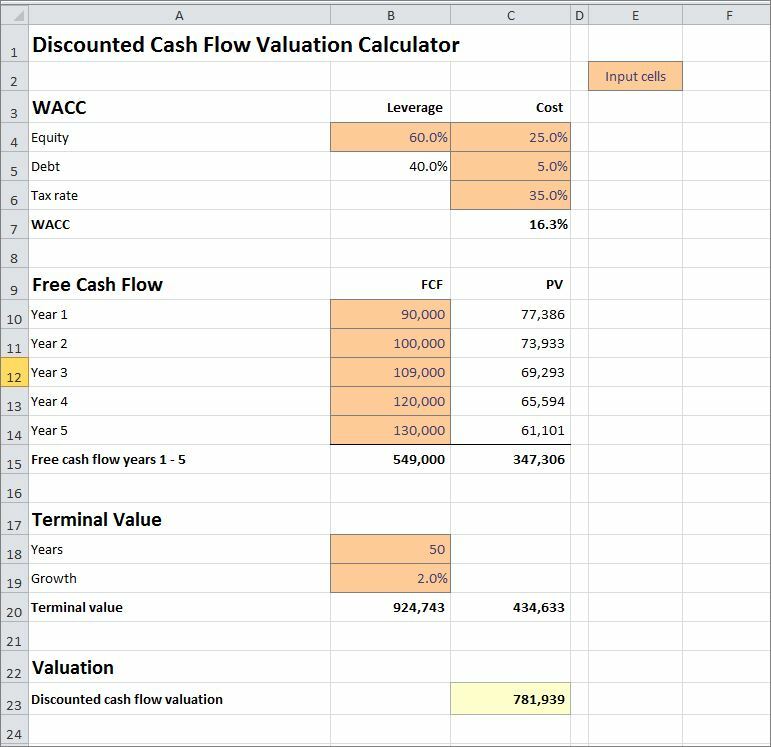 The discounted cash flow calculator, which is available for download below, calculates the weighted average cost of capital (WACC) of the business, and then applies this to its free cash flows (including the terminal value), to generate an estimated valuation of the business’s operations. Enter the percentage of the business funded by equity finance. For example, if the total capital of a business is 75,000 of which equity is 45,000 and debt is 30,000, then the business is 60% (45,000 / 75,000) funded by equity. The discounted cash flow valuation calculator will calculate the balance funded by debt (in this case 40%). Enter the cost of equity which represents the return required by the equity investors in the business. Enter the cost of debt which represents the interest and fees payable to lenders to the business. So for example, if the interest rate on debt finance is five percent, enter 5%. Enter the income tax rate payable by the business. The tax rate is used to calculate the after tax cost of debt. The discounted cash flow calculator calculates the weighted average cost of capital (WACC) taking into account the financial leverage of the business, the cost of equity and debt, and the income tax rate. Enter the free cash flow for years one to five. Free cash flow (FCF) is the cash flow available to the business after allowing for the working capital and capital expenditure requirements needed to maintain its current growth. The concept behind free cash flow is more fully discussed in our free cash flow tutorial. For the purposes of this discounted cash flow valuation calculator, free cash flow is given by the following formula below. Both of these amounts can be found in the cash flow statement of our financial projections template. For each year and in total, the free cash flow valuation calculator calculates the present value (PV) of the cash flow using the weighted average cost of capital as the discount rate. The terminal value represents the value of all the future cash flows of the business beyond year five. As it is not possible to estimate these cash flows individually, they are based on the year 5 cash flow and are included for a number of years at an assumed growth rate. If the cash flows are expected to last for say a total of fifty years (including the first five years), then enter the number of years as 50. The total number of years (50) represents the 5 years entered individually, and a further 45 years at the assumed growth rate. If the cash flows are assumed to last indefinitely, often referred to as in perpetuity, then enter 999. Finally, enter the rate at which the cash flows are expected to grow each year. For example, if the cash flows are expected to grow at the rate of two percent each year, enter 2%. This growth rate is first applied to the year 5 cash flow. For example, if the cash flow for year 5 is say 130,000, the year 6 cash flow will be 132,600 (130000 x 102%), the year 7 cash flow will be 135,252 (132,600 x 102%), and so on for the number of years entered. The free cash flow calculator calculates the terminal value at the end of year 5 and the present value (PV) of the terminal cash flow today. The discounted cash flow valuation calculator works out the value of the future cash flows based on the parameters entered, and uses this as an estimate of the value of the business’s operations. The discounted cash flow valuation calculator is available for download in Excel format by following the link below. Users use this discounted cash flow calculator at their own risk. We make no warranty or representation as to its accuracy and we are covered by the terms of our legal disclaimer, which you are deemed to have read. This is an example of a discounted future cash flow calculator that you might use when preparing financial projections in Excel. It is purely illustrative of a company valuation calculator. This is not intended to reflect general standards or targets for any particular company or sector. If you do spot a mistake in the free cash flow calculator, please let us know and we will try to fix it.